When is it best to use hydrocolloid dressings, and can they be used on dry skin as well as wet skin? Any wound is typically a good candidate for the use of a hydrocolloid dressing. They are ideal for wounds with mild to moderate exudate. but can also be used very effectively on dry wounds. Hydrocolloids are perhaps the most commonly used of all wound treatment dressings because they are so versatile. They can be used effectively on wet wounds as well as dry wounds. When wounds produce mild to moderate exudate, the gel in the hydrocolloid dressing is activated to provide a barrier to prevent injury to the wound. In addition the exterior of the dressing is designed to be waterproof from the outside while still allowing excess fluid and gel to be expelled from the dressing. This is not true of all hydrocolloid dressings, however. Some are designed to retain the fluids and have a thicker, more cohesive gel that remains in the dressing. One of the advantages of using hydrocolloid dressing is that it can be applied to both moist or wet skin as well as dry skin. This is an important feature in wound dressing in emergency situations, or when immediate wound treatment is required before periwound tissues are properly dried. What are the gel-forming compounds used in hydrocolloid dressings? The actual gel-forming agents within the dressing may vary depending on the specific brand or type of hydrocolloid dressing. In many dressings, the gel forming agent is carboxymethylcellulose combined with a natural gelatin product. There will be additional types of materials, including adhesives that are included in the dressing. Finally, a polyurethane foam will be used to form the barrier and contain the gel once it is formed by contact with the exudate. The types and combinations of gelatins and other compounds in the hydrocolloid dressing is the key factor in determining the type of gel produced. Thicker gels are preferred by many, since this eliminates the need for more frequent dressing changes even with moderate exudate levels. Can hydrocolloid dressings be used on diabetic wounds and for burn treatment? Any type of wound that requires frequent changes, or that may result in patient pain and discomfort during changes is a good candidate for a hydrocolloid dressing. This includes diabetic types of ulcers and wounds as well as burns. There is some research that indicates that care needs to be taken in any use of hydrocolloid dressings where necrotic tissue is present at the time of dressing. It is essential that all necrotic tissue be removed from the wound and only healthy periwound tissue be left before using a hydrocolloid dressing. In cases where this is not carefully done prior to using the dressing there is a high risk of the necrotic tissue spreading under the dressing, resulting in a more significant wound. Many doctors carefully evaluate each particular wound, particularly in diabetics, before deciding if this is the correct choice in dressing. There are many different types of dressings, and each serves a specific function. 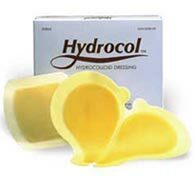 Hydrocolloid dressings are a great choice for wounds with low to moderate exudate.